OLATHE — The snow is blowing and the wind chill is rapidly approaching single digits as Art Ercolani pulls out of his driveway and heads toward St. Paul Church here. 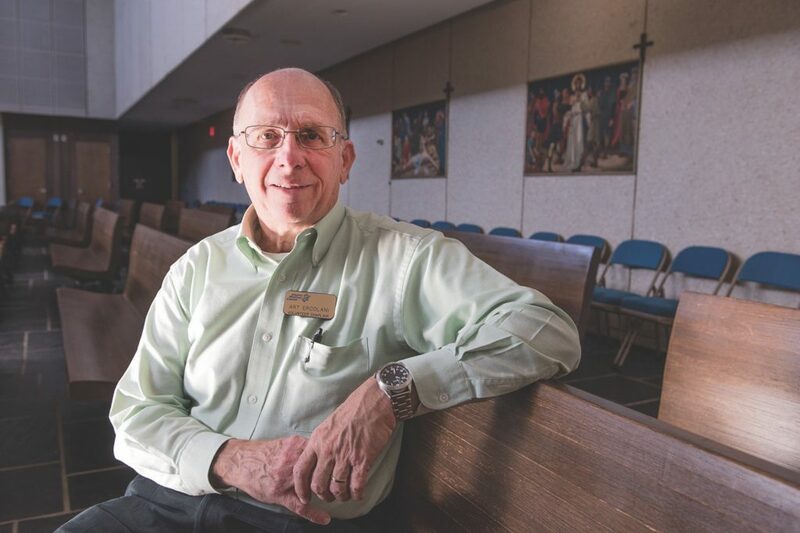 As a volunteer chaplain to Olathe Medical Center Hospice, he’s on call this weekend. Although there is no immediate need for his services, he wants to make sure that those Catholics in his care will have the opportunity to receive Communion this week. Ercolani provides assistance to patients and the families of those in hospice care. Although he provides guidance to patients of any faith, he brings Communion on a weekly basis to those who are Catholic. And when their time approaches, he notifies a priest for the sacrament of the anointing of the sick. He is also available to conduct a bedside service with families after the death of their loved one and before the funeral director takes over. Ercolani also often finds himself traveling many miles in all kinds of weather to visit hospice patients still in their homes. He logged over 4,400 such miles on his vehicle last year alone. Although Ercolani has been a full-time volunteer since his retirement in 2005 following 38 years at Honeywell — where he worked as an electronics design engineer — he has been a hospice volunteer since 1990. While some people would see his work as depressing, Ercolani said it is far from that. “I usually get a feeling that I’ve helped the patient and the patient’s family be as prepared as they can be for the coming end of life,” said Ercolani. Family dynamics are also a part of Ercolani’s work — helping a patient address feelings of being a burden to loved ones or working through any guilt feelings of leaving them behind. He’s also had to help explain to children what’s happening when a grandparent with whom they have a special attachment is dying, and has helped spouses and also young parents of a dying child cope with feelings of being left behind. As a chaplain, Ercolani also conducts group bereavement sessions on the third Tuesday of each month and attends many continuing education seminars on the topic. As a veteran himself, Ercolani can also relate to those patients — both men and women — who have served in the armed forces. “Veterans can talk to veterans, and we can open up to each other,” he said. While Ercolani admitted he gets attached to his patients — especially those he has worked with for six to eight months — he believes he has been able to work through these losses. In general, he said his work with hospice patients has left him with the feeling that he is doing exactly what he was meant to do. “A lot of my patients have told me they’ll be watching for me when it will be my time to leave this life,” he said. “I have witnessed many patients looking up and reaching upward, smiling right before they pass away. Thank you, Art for your dedication and big heart!